Harris County is by no means the only arena in which TOP and its allies scored convincingly in 2016. East Dallas County, a band of suburbs to the east and south of Dallas, comprises House District 107 in the state legislature. Despite a Latino and African-American majority, Republicans have been carrying the district for years, albeit with narrow margins. 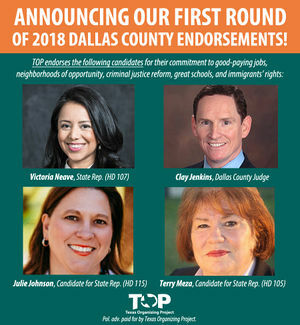 This time, however, thanks to an intense registration and organizing drive by Texas Organizing Project and other groups, including labor unions, Victoria Neave, the Democratic candidate, ousted her Republican opponent by 836 votes. Texas Organizing Project PAC, November 6, 2016. Instead of worrying about the outcome of the election, let's act to make sure we elect Hillary Clinton, Ed Gonzalez for Harris County Sheriff, Kim Ogg for Harris County District Attorney, Ann Harris Bennett for Tax Assessor Collector - Voter Registrar, Javier Salazar for Bexar County Sheriff, Pete Gallego for Congress, Victoria Neave for Texas State Representative and Friends for Terry Meza HD 105! Texas Organizing Project PAC, 2018 endorsements. This page was last modified on 27 July 2018, at 03:03.